Its BAFTA weekend and I’m not expecting The Grey to be getting any nominations other than for film shot in the coldest location (and Tinker, Tailor, Soldier, Spy may beat it in that category too). As is pretty obvious from the poster above it’s another Liam Neeson vehicle trying to find the ingredient that he brought to Taken a few years ago. The plot is pretty straight forward: a plane loaded with workers from an Alaskan oil drilling operation crash in the wild. Those that survive are threatened by the weather, lack of food, lack of medicine and hostile terrain. Driving them is a belief that no one is coming looking for them and a hungry pack of wolves. Holding them back are their personal demons and internal disputes. 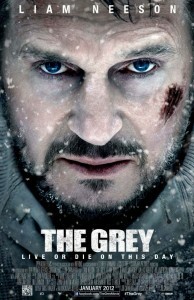 The story is interspersed with flash backs to Neeson’s Ottway in what appear, at least at first, to be happier times. This little sub plot is somewhat laboured. I can understand what it was trying to achieve often interrupted the more visceral conflict between the group of crash survivors. Maybe if, like the lads sat behind me in the cinema I’d not spotted where it was going, earlier in the film it would have provided a more interesting twist in the sub plot to set up the last scene of the film. Overall for me this is a relatively fun, reasonably acted survival horror film but not a personal classic.